It’s crazy how expensive it can be to decorate your home. Skip the overpriced décor and craft your own DIY accent pieces to give your home a more personal feel. Plus, just imagine how great it’ll feel when guests ask where your homemade items are from… they’re from you, by the way. Happy Crafting! 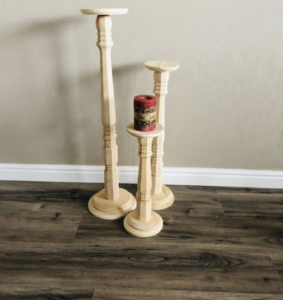 My tall wood pillar candlestick holders make a beautiful addition to your fireplace, tables or dining room table. Each candlestick is ready to be stained, spray painted or painted with acrylic in a color that matches your décor. This set can make a room go from drab to fab! Ready to really use your crafty side? Get ready to paint, burn, stamp or decoupage these wooden bowls to match your décor. Or leave them as is! They make a great addition to your kitchen, or can be used as jewelry bowls. These wooden items have two different uses… candlestick holders or cake stands! They are a great way to decorate your home. Simply add your ideal color to them by staining, painting or spray painting. They are sure to complete the look of any room in your home. Whether you’re looking to freshen up the look of your home with a couple pieces, or are trying to completely change up your current décor, DIY projects will help add that personal touch to your redecorating. Spring Break is a time for relaxation and a retreat from the stresses of everyday life. However, you don’t always have to travel far to have a good time. DIY projects are the perfect way to make the most of your Spring Break in the comfort of your home, while also saving money. Not to mention they will be a huge hit with kids who are out of school for the week! Here are a few DIY ideas for the ultimate staycay. Spring is a season known for blooming flowers and plants, so what better way to celebrate than by planting your own flowers? Use my tall wooden flower pots to plant several different kinds of flowers, and enjoy watching them bloom. These unfinished wooden pots are also great for painting! Use your creativity to add a personal touch. Order them today! As the season approaches, the birds will as well. What better way to support the environment than by making a pleasant home for earth’s winged creatures? My unfinished wooden birdhouses come ready-to-decorate and paint. Check them out today! The Tooth Fairy keeps busy during the Spring too! What better way to hold those baby teeth than with a personalized box? Whether your kids want to keep their teeth in the box until the Tooth Fairy comes, or you want to use them as keepsake boxes, these unfinished wooden boxes are the perfect craft idea. Order yours today! Whether you choose to travel or stay home, you can always find fun activities for Spring Break. Just enjoy yourself and have fun! Unfortunately, stress is an all to common phenomenon for many of us. However, did you know that DIY projects and crafting are super beneficial to your happiness? 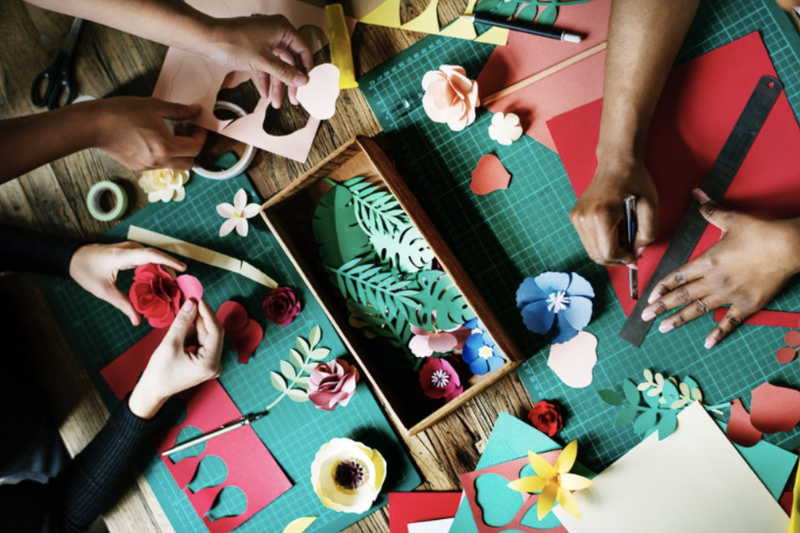 Here are a few reasons why crafting is deemed a stress-relieving activity. Studies show a correlation between crafting and our moods. In fact, the use of crafting to bring people together dates way back! Thousands of years ago, quilting offered women an escape from isolation. In addition, clay work has been shown to reduce adverse behavior. Creativity allows people express themselves in a unique way and encourages a different outlook on life. This alternative perspective helps turn negative thoughts into positive ones. Crafting helps relieve stress and anxiety. Crafters experience a sense of satisfaction when finishing up their creation, which results in reduced stress. A study titled The Influence of Art Making on Anxiety: A Pilot Study, found that even minimal exposure to art can greatly reduce a person’s anxiety levels. Crafting also serves as an escape, allowing crafters to focus on the positives. DIY crafting is an activity that naturally triggers dopamine, a neurotransmitter responsible for happiness and bliss. In a study with 3,500 knitters, 81% of participants reported feeling happier and more at ease. Picking up a hobby is fun and fulfilling. It gives us a necessary outlet to express ourselves and find joy. Feel free to browse through the HobKnobin site to find the perfect craft items! Happy National Wedding Month! To commemorate this special time, I thought I’d share my favorite wedding décor ideas. A wedding is one of the most momentous times in a person’s life, and ensuring the wedding décor is unique and personalized can really help the day feel that much more special. No matter what essence or theme you are trying to bring to your wedding, I have options for you! These wedding sign holders are carefully handmade out of hard maple wood. Each wooden circle is sanded and smooth to the touch, ready to be painted or stained with your color of choice to match your theme. These holders are a great way to display your wedding signs or table numbers! 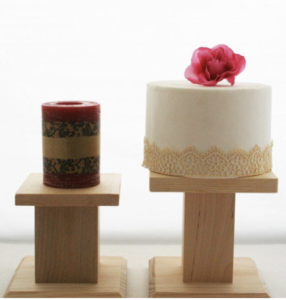 My wooden cake stands allow you to feature your cake and/or your cupcakes—all while saving you valuable table space! They make an eye-catching centerpiece for any wedding. I left them unfinished, so you can paint or stain them in a color that matches the rest of your décor! My hand-painted, napkin ring holders will add a finishing touch to your rustic-themed wedding. Set your wedding reception tables in style! These wedding décor items are sure to add a personal touch to your wedding. Want some more craft and décor ideas? Browse my shop today! How My Donut Stands Ended Up At J-Lo’s House! 2019 is already off to a great start! 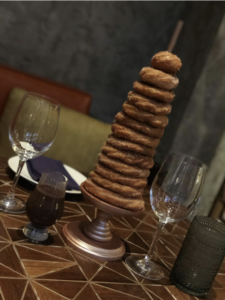 The Executive Pastry Chef of the Chica has been using my stands to display her renowned Churro Towers. The chef herself, Sara Mae, sent me the sweetest note about how much of a hit the stands are! In addition to her amazing praise and feedback, Sara let me in on a fun fact. She recently sent some of my stands to Chef Lorena Garcia to use for Christmas Brunch at Jennifer Lopez’s home. Lorena ended up leaving them there, which means something I hand crafted is at J-Lo’s home right now! The year has already brought so many delightful surprises, and I can’t wait to see what’s next. 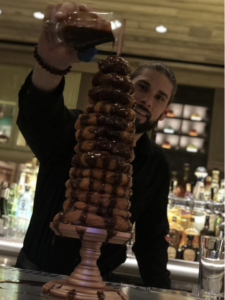 Check out these mouth watering photos of Sara’s Churro Towers. If you are visiting Las Vegas soon, be sure to dine at Chica! Make a reservation here. Kid birthday parties can be so much fun! Deciding on the theme, decorations and activities make the days leading up to the event seem like part of the celebration itself. However, even the simplest party requires planning. The sooner you start organizing, the earlier the excitement begins and the fewer details you’ll have to work out on the day itself. No matter what theme you choose, all kids love taking party favors home as a keepsake from the festivities. Here are a few wooden party favors that can be gifted as-is, or decorated with your finishing touch to commemorate the special occasion. Yo-yo’s are a traditional toy that never goes out of style. Choose from an assorted variety of themed yo-yo’s, including character-based and monogrammed, or select all of the same theme so kids don’t have to compete with each other. I also offer unfinished wooden yo yos. You can paint these and adorn with your own party theme. You can even use the unfinished wooden yo-yos to create a party craft activity for the kids to paint and take home as a souvenir. If you want to host a crafty-themed party to entertain the little ones, these 7″ unfinished wooden rolling pins make for a great paint-and-take party favor. These red flip flop tops are a fun toy to play with at the party, and the children will surely want to take one home. Use as part of the party theme for children to play with during the day, and gift one to each guest as a party favor to play with later. Kids love to have their own bag of goodies as a keepsake souvenir. If you are giving small items as favors, our small organza bags come in various colors to match your party theme. Our wooden tags are perfect for handwriting the birthday child’s name, date or any other special message to remember. 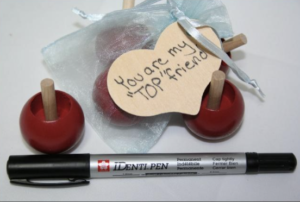 Choose from our wood circle birthday tags or wood heart-shaped tags to write a message to your guests. These fun, yet simple party favors are sure to please a young crowd — and no batteries or tech are required! These small wooden bowls are versatile, and with a bit of creativity, you can use them all over the house. 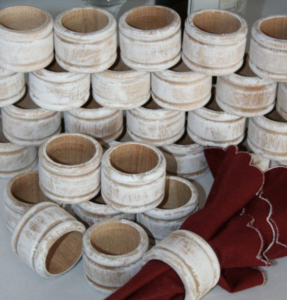 Each unfinished bowl is 2-1/2″ wide x 1-1/8″ tall, and bulk pricing options are available. Whether you want to buy one for a specific use, or stock up to design matching décor throughout your home, there are a variety of uses for these simple, wooden bowls. Do you like to set your ingredients and spices out before you start cooking? 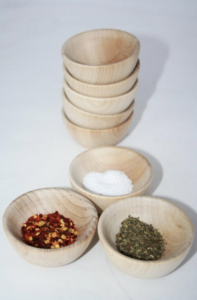 Use your wooden spice bowls to get ready to cook your yummy recipe. Do you have a blog where you take pictures of your ingredients? These are a great way to display your spices or condiments. These unfinished wood bowls are chemical free, and best for dry ingredients. If you do need to clean your mini bowls, you can do so by wiping them out with a damp cloth. You can also seal your bowl with a food grade oil. 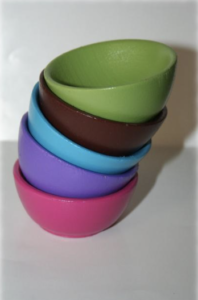 Add these mini wooden bowls to your child’s kitchen play set for imaginative play. 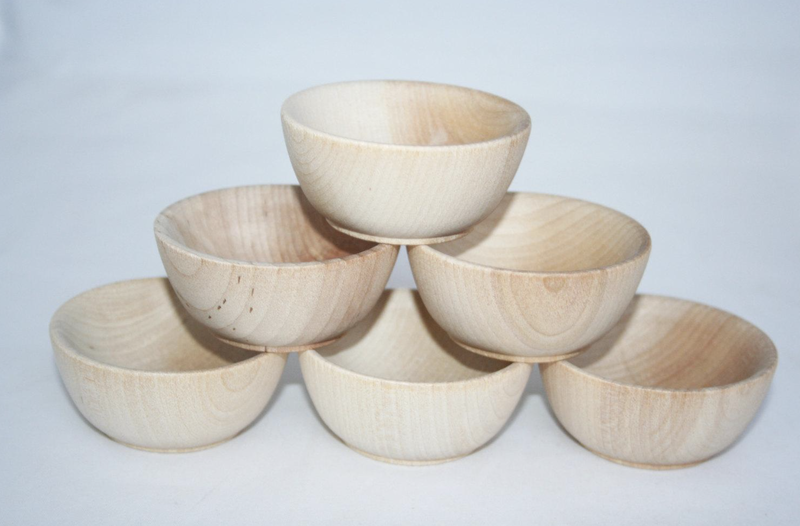 These small wooden bowls are also great for teaching instruction and sorting games. Finish each bowl in a specific color and teach kids how to sort colors, shapes and sizes. Your DIY wooden bowls will arrive unfinished and ready for your creative touch. Use your crafty side by either painting your wood bowl, stamping them or burning them. In this video, Martha Stewart shows you how to transform wooden bowls into beautiful gifts. Use your imagination to explore your own decorative ideas! Christmas is a magical time of year for both children and those young at heart. But playing the role of Santa’s helper can sometimes feel like quite a financial burden. However, stocking stuffers and gifts don’t necessarily need to break the piggy bank! Here are 3 fun stocking stuffer ideas for the little ones on your list. 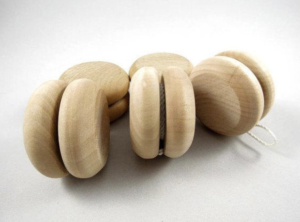 There are so many uses for these smooth maple wooden rings. They are perfect for baby teethers, baby’s first ornaments, ring toss, or holiday craft activities with the kids. These rings come in 6 sizes, from 1.5” all the way up to 3”, making them an easy choice for multipurpose DIY holiday craft projects. Little ones will love this miniature bowling set of ten wooden 3-3/4″ bowling pins. Line them up on your floor or table, roll the solid wooden 2″ ball towards your bowling pins and see how many pins your little one can knock down- YAY! 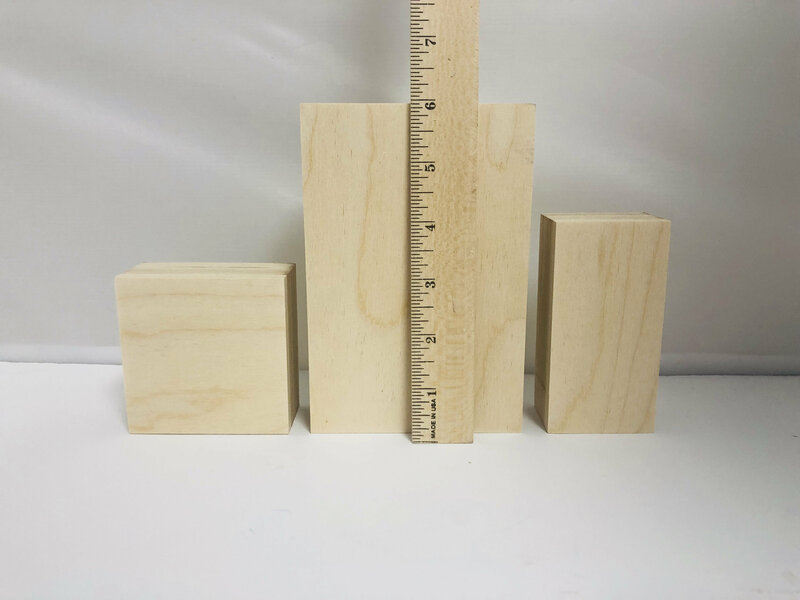 Choose from 4 different sizes–1.5″ to 5″ in height. It doesn’t pose as a choking hazard. It’s a great size for small hands! Note: Decorated pins shown as an example for illustration purposes only. Ball-in-cup is a timeless game for children (and adults who are feeling nostalgic). It is a perfect game to play at birthday parties, give as a stocking stuffer or to keep your child busy while traveling. This unfinished wooden game comes hand painted or ready for you to paint (as shown in the picture above). Shopping for others, especially your children and grandchildren, is always fun. Keep the fun going by remembering you can also save money by supplementing their stockings with these fun and personalized DIY gifts. Oh what fun it is to give the best stocking stuffers this holiday season! Thanksgiving is tomorrow, so I thought I’d share some adorable Thanksgiving DIY crafts to get you in the holiday spirit. These DIY projects result in great decor and centerpieces for your holiday dinner. Happy Crafting! These wooden figures are ready to come to life with a little paint and your imagination. They make the ultimate Thanksgiving DIY crafts! Fashion them into pilgrims for kids play or put on display. You can use your creativity and have fun with the colors and setup! These wooden acorns are a fall favorite and make the perfect Thanksgiving DIY crafts. I can think of no better Thanksgiving centerpiece! You can also get your child in on the holiday decorating by having them help stain or paint them. Add some glitter for extra flair! After painting, add to a glass bowl and show off you acorn creations to all of your guests! Now for dessert! Display your yummy Thanksgiving goodies on a wooden tiered cupcake stand. It makes an eye catching centerpiece to any holiday function. Have the entire family join in on the fun by painting or staining it in the color of your choice. When I started my Etsy shop in 2009, I was like many first-time entrepreneurs—just trying to find a way to monetize what I love to do. Since then, I have come to learn the ins and outs of starting a business. If you are starting an online business, I know it can seem like a daunting task. But don’t let that scare you away! Here are some tips that I believe will put you on the right path. Sell desirable products or services. First, you must establish the product you wish to sell. What is your passion that you’d love to turn into a job? Discover customer needs within that passion. Your target audience are people looking for your type of products/ services, which serve as a solution to their problem. For me, I love to create decor and crafts. 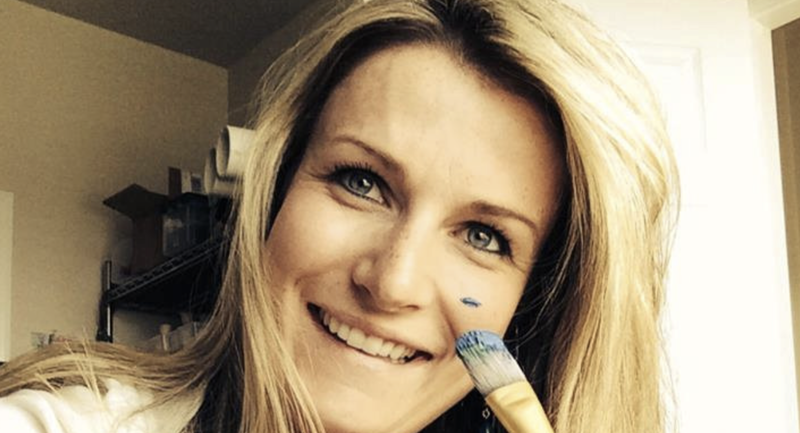 There are plenty of event planners and parents who are looking for my type of products—i.e. my products serve as a solution to their decorating problems. Maybe your passion is travel? Look into travel blogging. Baking? Look into an online bakery. Find a need within your passion and fill it. Think of catchy language and a consistent brand voice that will speak to your target audience. Clearly articulate why they will benefit from your product. Include reviews and testimonials to establish a good reputation. Address any possible concerns right away. The goal is to write copy that lets your audience know how much the product or service will help them. It is best to look at it from the customer’s point of view. Be sure to develop quality images of your product. Factors to consider include natural lighting, consistent branding and key product points such as measurements. Good imagery can be the reason someone clicks the ‘Buy Now’ button, so don’t overlook its importance! While you may have to hire out for this one, it is worth it. In this tech age of impatience and instant gratification, it is essential to have a fast, user-friendly site when starting an online business. User-friendly sites keep it simple with the fonts and background, and are easy to maneuver. If need be, resort to an expert web developer for their opinions and recommendations. When starting an online business, becoming known as an expert in your field will help draw in more clientele. This includes creating expert content, such as blogs and videos. Utilizing social media and SEO (again, you may have to consult with a pro) will help promote this content and drive more traffic to your website.